Customer Experience is Dead – the case for the prosecution! Over the last ten years, I have observed and been part of a tidal wave of focus on Customer Experience. Despite the fact that customer journeys have always existed (although few actually realised it) and customers have always been willing to give feedback, it is only since the start of the new millennium that organisations began to recognise that doing the right thing by their customers might make sense. In 2014, we are seeing more companies than ever before ask us to tell them what we think. Businesses all over the globe are creating millions of wonderful looking customer journey maps. More employees than ever before have a remuneration package that is affected by improving customer perception. A whole new profession has been created, culminating in the founding of the Customer Experience Professionals Association – we even have a professional qualification in the form of CCXP – Certified Customer Experience Professional. Now more than ever should be a wonderful time to be a customer……………right? Or wrong? Two and a half weeks ago the Golding family lost Wi-Fi connection at home. Our Wi-Fi has always been a little bit hit and miss, but it has worked to a degree that we have not had to ask for help for over two years (since we switched from another provider). You do not realise how critical Wi-Fi is in your home until you lose it – a fundamental change in customer needs since the turn of the millennium. As soon as we lost connection, we contacted our provider for assistance. In the subsequent two and half weeks, we have been lied to, fobbed off, and subject to inept customer service. We were initially advised that there was a problem on the line and it would have to be investigated by Openreach. We were told that someone would contact us when this had happened – no-one did. On re-contacting our provider, we were told that there was not a problem on the line and it was probably our router that was causing the problem – it was nice of someone to tell us. We were told that a new router would be sent, and given a delivery date. You guessed it – that date arrived, but the router did not. On re-contacting our provider, we were told that a router had not actually been sent. By now, Mrs Golding was getting rather frustrated and upset. I am fortunate to know senior leaders in Customer Service or Customer Experience roles for many large UK companies. Our experience was so poor, I had to resort to contacting the Head of Customer Service for this company via LinkedIn – I hate to think how long resolution of our problem would have taken if I had not done this. The new router arrived a day later. We finally thought this would bring an end to our Wi-Fi purgatory. You guessed it…..the new router did not work. To cut a long story short, the provider finally agreed to send a Broadband engineer to our home – he sorted the problem in thirty minutes. Why it took two and half weeks for this to happen is beyond me. This experience was as bad as experiences can get for customers. The experience generated a huge amount of unnecessary effort. The experience cost us money. The experience left us feeling frustrated and upset. We will not be customers of this Broadband provider for much longer. This company appears to be ‘sitting on the beach’ whilst the tidal wave of Customer Experience roars on past! 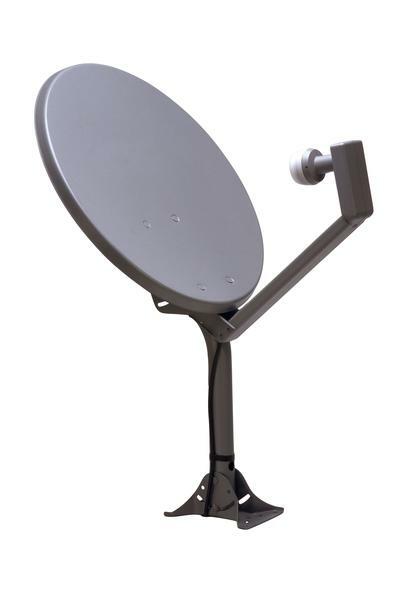 My family is not having much luck with technology at the moment, and around the same time we lost our W-Fi, we also lost the use of our satellite TV. Television, like many things, has changed beyond belief in the last twenty years. When I was the same age as my children, I was very happy to make do with four channels and a machine called a video player! In 2014, we have access to hundreds of channels, with the ability to view and record using the same ‘machine’. We can access ‘box sets’, watch recently released movies, and even view online TV services (such as BBC I-Player via Wi-Fi (if we had Wi-Fi that is!). Unlike twenty years ago, the customer also has a great deal of choice. We can choose to watch TV for free (technically in the UK it is not free as we pay our TV licence) using a digital ‘freesat’ or ‘freeview’ box. If you want access to more channels, you can choose to buy your service from a number of different providers. We have been a customer of one of these providers for over ten years. In my book, this makes us a loyal customer. Our satellite box came to a grinding halt over two weeks ago – much to the distress of the Golding children (they do not watch much TV, but what they do watch is not available on freeview). Once again, we sometimes take for granted the things we have – once it is gone, you realise how much you rely on it. Like the kids, we do not watch much TV either – we tend to record a small number of things and watch them when we want – it is infuriating when that ability suddenly disappears. On contacting the company concerned, it was confirmed that the box, which was over seven years old, had come to the end of its life. We were given the option to replace the box – but to do so, we would have to ‘upgrade’ to a new package. This would cost us £5 more a month than our current package. In other words, if you want a new box, you have to pay us more money. I have been a customer of this company for over ten years. I have the potential to continue being a customer for another ten, twenty and possibly more years. Yet when I ask for the replacement of the box that provides the service, I am forced to ‘upgrade’ to a package I do not want! I felt as though the company were holding us to ransom – each time I phoned them I was given a slightly different story. It took two weeks of conversation for them to offer me a ‘compromise’ – we will pay £1.80 more a month for the new package we did not want in the first place. They will also replace the box for ‘free’. Customers should not have to fight to remain a customer. I have always thought it wrong for new customers to be offered a better deal than long-standing loyal customers. The whole experience has left a very sour taste in my mouth. I do not trust this company and do not like the way they treat their loyal customers. When the deal comes to an end, they will lose this particular customer for good – and with it, the opportunity to receive twenty+ years more income from me. It is not just the world of technology that has served up unacceptable experiences for me over the last two weeks. Last week, I stayed for two nights on business at a stunning hotel in Surrey. I say stunning as from the outside, that is exactly what it was. I would go as far to say as it is one of the most beautiful looking hotels I have ever visited. Very sadly, the inside of the hotel is very very different. Stunning it is not. 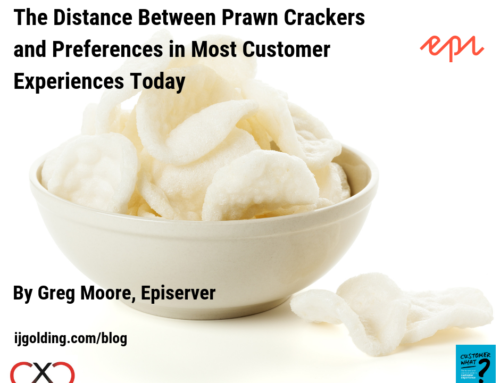 Regular readers of my blog will have viewed my standard ‘Customer Experience Review’ format. I wrote a review of this hotel – if you want to read the detail, you can do so here. If you do not want to read the detail, I will briefly summarise. The hotel is part of a group that promises to deliver ‘quality, service and attention to every last detail’. You are right in guessing that they radically fail to deliver on all of these promises. In three days and two nights, I received unacceptable service from disengaged employees. The accommodation was outdated, of poor quality and lacking on comfort. Basic facilities – such as the only lift on the hotel – did not work. I even bumped into a friendly cockroach in the hallway. I have read a number of publicly available customer reviews on this hotel – I am not the only one who has thought badly of it. I have also experienced other hotels owned by this particular group – my experience across two of their hotels is sadly consistent. This hotel group have obviously missed the tidal wave of Customer Experience – either that, or their definition of ‘quality, service and attention to every last detail’ is VERY different to mine! So there it is – my case for the prosecution. Broken promises; disengaged employees; unnecessary effort; customer dissatisfaction – sufficient evidence to suggest that Customer Experience is a very long way from being embedded in the culture of businesses. The question is, is this enough evidence to suggest that Customer Experience is therefore dead altogether? You will be pleased to hear that there is also a case for the defence – a case to prove that Customer Experience is very much alive – I will save that evidence for a future blog post. As someone who benefits from helping organisations that have a desire to transform their organisation to deliver better customer experiences, I should be pleased that there are still so many businesses falling short of doing so. It actually gives me no pleasure to highlight examples like those you have just read. In doing so though, I genuinely hope that I am able to bring to life why a focus on Customer Experience is not yet something that we, the paying customer, can expect to receive on a regular and consistent basis. Despite the fact that the last ten years have seen a Customer Experience tidal wave, the wave is only gaining height and speed – it is yet to break. 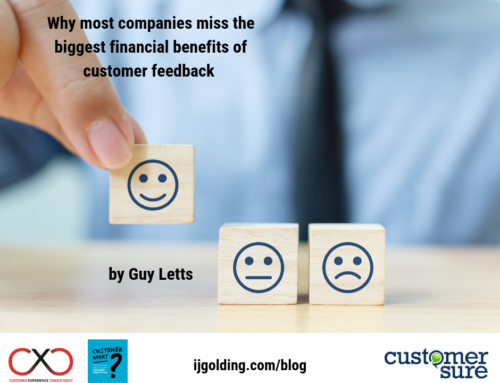 Customer Experience is not a fad – it is not a project. 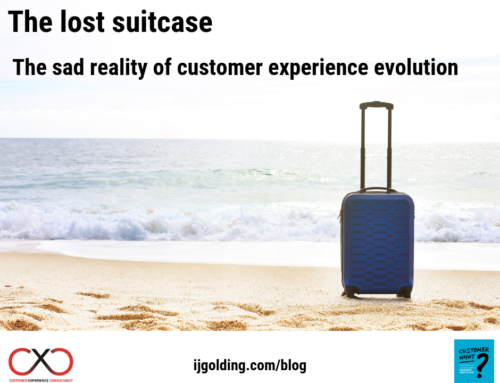 Customer Experience is why our organisations exist – failure to recognise that could be fatal. Customer Experience will never die – it is the businesses that fail to recognise the importance of it that will. Do you have more evidence for the prosecution? I would love to hear it if you do. Just to re-iterate – I will be writing the case for the defence very soon! I eventually insisted on speaking to a manager, to rant about my experience, and was point blanked lied to and told that the problem was with my internet provider and not with them…. Funny, my internet provider never had problems with your site until you made the changes?!?! None the less, I started shopping with a different provider, even though it was considerably more time consuming, and perhaps of lower quality. And then Yesterday, I got a survey asking me why I haven’t been shopping with them!!! LOL ….. Really, Pay attention! Thank you so much for sharing the story Coreen. Let us hope that our continued efforts will see stories like this harder to come by in the future…..although how long in the future is anyone’s guess! At the moment I’m trying to persuade a satellite tv provider, a driving school and an estate agent to provide even the basics of good CX. The TV company even charge premium rate when you have to phone for help.Live chat isn’t (live) and Twitter took 5 days to resolve. I’ll be exploring other options.The driving school told me it was ‘my fault’ that I couldn’t re-book a lesson I had cancelled. They couldn’t refund the charge or book a replacement lesson either. The estate agent experience beggars belief but so far we’ve had to chase details, re-write said details, point out inaccuracies on the websites and advise that our listed building didn’t need an EPC. We are still waiting for finalised details more than 3 weeks later. Effort? Obtaining service is fast becoming a full time job. Karen – I so feel your pain! Your quote at the end is bang on – I may use that quote going forward if ok with you?! Its just a rebrand for customer service. Some companies are good at it, some companies are bad at it. 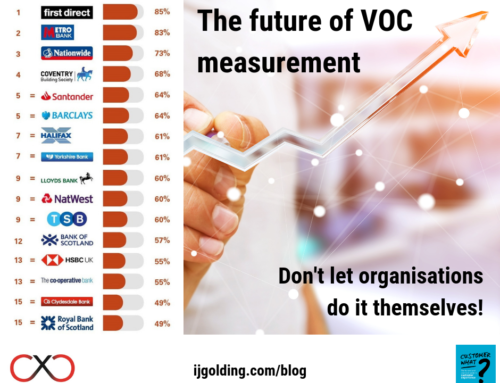 Some companies share VoC information, some don’t. Some companies take notice of customer satisfaction, some companies don’t. To say Customer Experience is dead is no more true than it is true to say Customer Service is dead. The reason there has been an explosion of interest is simply because software vendors have grabbed hold of the term to sell CRM services and measurement systems. Before we measured a relationship, now we can measure everything. Bottom-line: its all just misinformation. To be fair Michael, I do know a number of organisations all over the world who do take Customer Experience very seriously. Whilst some have rebranded their Customer Service or Marketing functions, the is a growing wave of customer centric companies who understand the significance and importance of transforming their organisation to genuinely put customers and colleagues at the heart. Ultimately there will be businesses who do as you describe, but over he coming years they will continue to struggle to meet the ever increasing demands of consumers. If they genuinely fail to change, they will struggle to survive. Many thanks for taking the time to read and comment – it is very much appreciated. Hi Ian. Well I agree with you up to a point. I think a lot of CEM still misses the point and might as well be called service quality. Which by the way is not a bad thing! For CEM to be different it must be more than service quality which is why it was originally interesting and different as a concept i.e., Pine and Gilmour. Of course, to create an ‘Experience’ means having a good idea and good execution, and does not easily allow box sellers and consultancies to make money. Hence its bastardisation. Many thanks for taking the time to read and respond to the post Steven – your opinion is very much appreciated.